"Am I ON?" This is the question that is eliminated with the CamMate Talent Tally Light Kit. Unlike other Tally light kits, this is used for both the Talent in front of the camera and more importantly the operator behind the camera. This full kit comes in two parts. 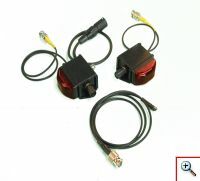 The Talent Tally, mounts to CamMate's head and has a red light that is powered by LEDs, a sensitivity adjuster, a BNC female connection for the light sensor, (1) photovoltaic sensor, a standard 4 pin 12V DC power that plugs into the CamMate Head, a BNC male wire connection that uses one of the BNC connections on the CamMate head to send to signal to the Operator's Tally light. The second half of the kit is the Operator Tally. It also has the same red light, but has an adjustable brightness control. It has a BNC connection wire that attaches to the back of CamMate's electronics box, to work in correlation with the input the Talent Tally is using. When ordering please state if you are using this kit with CamMate's Dutch Roll.